New Year: Resolutions and Solutions! As the year draws to a close, it ends in a flurry of chaos and obligations and what feels like an insurmountable time deficit. As we ring in a new year, we resolve to make some changes. Instead of the usual resolutions about weight loss and fitness that are gone by mid-January, let's go deeper and create some lasting habits instead! Get Mindful. Studies show that mental and physical health are tied to the practice of mindfulness. In the new year, make a commitment to sit in stillness for five minutes a day –no distractions. Do it in the car or lock yourself in the bathroom—just turn your phone off, step away from the computer, and turn inward. Set a timer so you won’t keep checking your watch and just notice. Notice your breathing, notice your heart rate, notice your thoughts as they arise (but try not to engage with them), notice the noises in the room. Feel everything start to slow down as you connect with the Inner You. When the timer goes off, try to take the calm with you into your day. Get Involved. Now more than ever, volunteering is so important. If the thought of taking on another charity drive fills you with dread, remember that SignUp.com takes the endless reply all email chains and telephone tag out of the picture. It’s never been easier to do good. Simply create a SignUp for your event or drive and then spread the word on social media or via your organization’s newsletter. Participants can sign up 24/7 from their smart phones, computers or tablets and automated emails will remind them of their commitments. Real time updates and eCalendar syncing take the pressure off of reminding everyone to show up or to give. Creating a community around a shared mission means everyone gets to be a part of the joy without taking on the stress. Get Healthy. In the new year, take control of your health one tiny step at a time. Think of the year as a marathon –don’t burn out the first month by trying to make all of the changes at once. 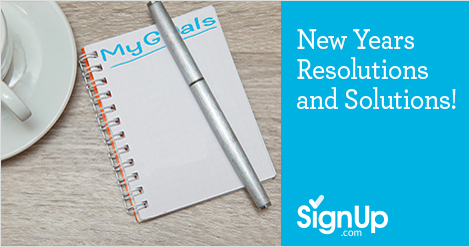 Resolve to adopt one small change every month. For example, in January, plan to cut back on your refined sugar and flour intake. Avoid all-or-nothing thinking by giving them up cold turkey –instead, take one meal each day and forego the bread and/or dessert. For February, add two glasses of water a day to your routine. For March, schedule your annual medical exams. For April, eat a meatless meal once per week, and so on. Each month, make one small change and at the end of the year, take stock of how much healthier you are! Get Moving. Avoid signing up for an arduous fitness class and instead, look for ways to incorporate movement into your daily routine. Dance in the kitchen while waiting for water to boil, take the stairs, park on the outskirts of the parking lot. Begin stretching for a few minutes before bed, add a few pushups if you want (because nothing will make you feel stronger than going from doing two pushups to 25 over the course of a few months.) Weather permitting, wash your car by hand. Sweep your driveway instead of using the blower. Sometimes opting to do things a slightly harder way can have an enormous impact on your fitness—and movement has been shown to combat depression, mental sluggishness, and overweight. Get Grateful. Studies have shown that a gratitude practice can increase your happiness by 25%! Adopt a practice of listing out one-to-three things you are grateful for every day. You can say them out loud, or journal them. Or, with an eye toward the end of the year, write them down on slips of paper, date them, and thrown them into a container. At the end of the year, read through them and reconstruct an entire year of thankfulness!